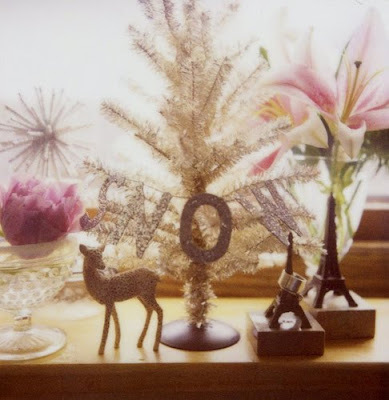 I realize I'm a bit behind on the holiday inspiration posts, but better late than never, right? I've been collecting some of my favorite holiday images from around the interwebs and I'll be posting them throughout the week. With decor like this, you don't even have to leave your bed on Christmas morning. 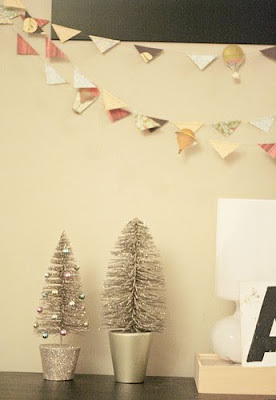 The combination of bunting and small trees is the perfect decor in an office. 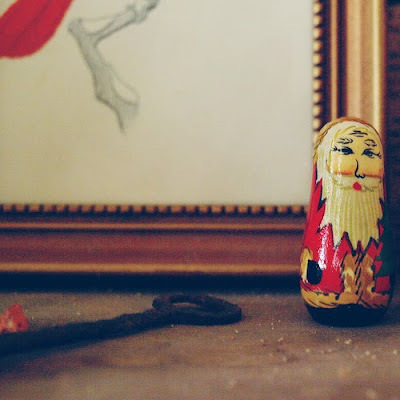 The Santa stacking dolls are very vintage and kind of quirky. Mantles were meant for holiday decorating and this one is even better because it includes a small plate wall. Such a romantic, subtle set up. Let it snow indeed. Much to my surprise, I think I like minimalist trees best. B and I won't be spending our holidays at home so we haven't done much in the way of holiday decorating. Have you? Thanks for all the inspiration! Sent you an ornament in my first annual ornament exchange!!! I've done some but I msut admist I feel a bit inadequate when I look at other's home postings! 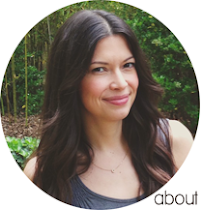 Love this roundup- especially the star in the first one. 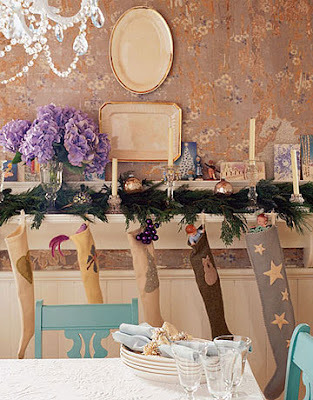 I could leave the stockings up all year! ..Me and my Kahuna have a tradition of only gifting via stockings. Hey, as long as you're posting before Christmas, you're on time! I love the first photo! I need to decorate my office. Normally, I just hang the incoming holiday cards on the door. But this year, I plan to hang a wreath as well. Thank goodness, my house is essentially done. If I have to hear one more person ask me: "how many more snowmen are you planning to pull out of the tub" I think I will scream. Thanks for inspiring...love the first photo! can i move into the room in the top photo please? Very nice selection here! I love that last tree best I think - with the white interior it looks stunning - a real statement! I love the stars at the top - they say "holiday", but you won't feel the pressure to take them down right away after xmas. my kind of decoration! ok, that first shot is making me sing THE STARS AT NIGHT ARE BIG AND BRIGHT (clap clap clap clap), DEEP IN THE HEART OF TEXAS! and shocker of all shockers, i like that minimal tree!!! crazy! these pics are all great!! i spent all weekend decorating and am almost done...i try to go all out at christmas! What great Christmas inspiration! I have not started decorating for Christmas, I leave New Orleans this week to go back up north to celebrate with the fam, and they are waiting for me and my sister to come home to start decorating! I cannot wait. love your pics...the santa dolls are cute. That 1st photo makes me want to crawl into bed and never leave. So comfy! We just did a tree like usual. I don't have a lot of Xmas decor so it's minimal but I like it. 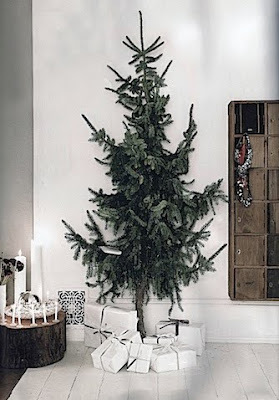 Never thought Christmas tree without adornments can be simply stunning! ooooh! i love the stars and the undecorated tree..how smart! I love all the super soft images you have here! So lovely! I ADORE that first image! ...and the last picture is so beautiful!! These are lovely photos! I really adore the "snow" tree and mini deer. We've done quite a bit of decorating, considering it's our first Christmas away from home! haha - I guess you could say I've been planning for this Christmas for a while. I love them all! Especially that last tree!! xo. Oh wow! Everything is so tasteful and gorgeous. Exactly what my Christmas decorations are NOT. For some reason, it's the one holiday where I go all out with the tacky tinsel, icicle lights, and an over-abundance of fake snow. Whoops. I love the way that bedroom is decorated! Presents at the foot of the bed? You'd have to wake up in a good mood in a room that's as delightful as this one. That bedroom looks so peaceful and happy. I would want to snuggle up, looking at the stars forever.